What liquid you use it up to you. I always simmer the giblets and neck of the turkey, covered, along with some onion, carrot and celery for a couple hours while the turkey is roasting. Give it a stir every so often. Strain out all of the solids [you can chop the giblets to add back into the finished gravy, but they have pretty much given their all, so I usually don't], and set the liquid aside in a 3 quart sauce pan, in which you will be making the gravy. When the turkey is done roasting, while it rests, pour off all of the pan drippings. Remove as much of the fat as you can [you can actually save it to make a roux for gravy for the leftovers]. I like to use a fat separator for this, but you can just spoon it off. Combine the pan dripping with the stock in the sauce pan. If it is more than 4 cups, you can reduce it down by boiling it, or remove the excess and save for the leftover. If it is less than 4 cups, bring it up to that level by adding a good quality low sodium chicken broth. Melt the butter in a wide saute pan. You can let it sizzle for a couple minutes to reduce some of moisture in it, which will shorten the time it takes to brown the roux, since part of that time is taken with cooking off that moisture - it's faster before you add the flour. Add the flour all at once, and begin whisking constantly, over medium low heat. It should be bubbling nicely, but not spattering at all, so adjust the heat if needed. It may be looking a little lumpy and shaggy at first, but it will smooth out gradually. Continue cooking and whisking, making sure to thoroughly reach all of the edges, so that you don't get any burned spots. 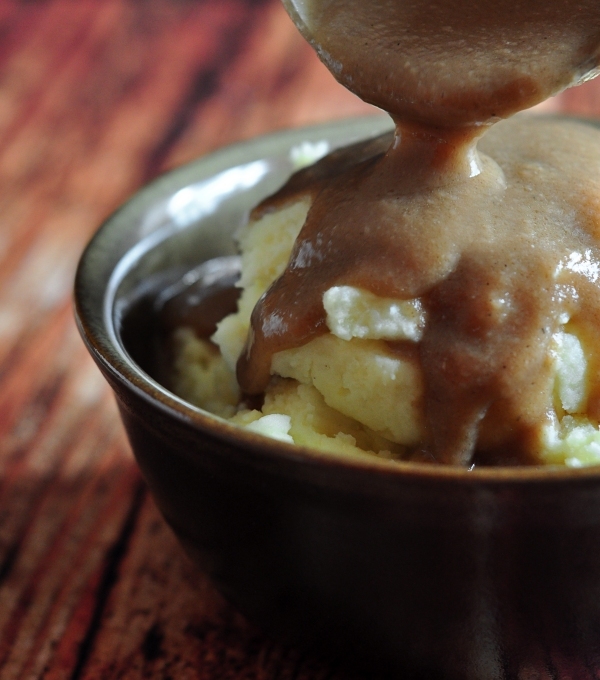 For this gravy, you want a color a little darker than peanut butter. It will be very smooth. When it's done, remove the pan from the heat, and scrape the roux into a heat safe container. if I am making the gravy right away, I use a heat safe glass measuring cup with a handle, which makes it really easy to slowly add the roux to the stock. Usually though, I am making it ahead to so I use a ramekin or small metal bowl. At this point the roux can be refrigerated until you need it. It will keep at least a couple weeks. If you are in the midst of roasting the turkey when you make it, it will be fine at room temperature for hours. Several hours before you are ready to make the gravy, take the roux out of the fridge so it can come to room temperature - if it has separated at all, just stir it back together. Bring the stock and pan drippings up to a low boil. Stirring constantly, gradually add the roux - about ¼ of it at a time - allowing it to fully return to a low boil after each addition. Continue adding each ¼, until you get to the desired consistency. This gravy will continue to thicken as it cools to serving temperature, so leave it slightly thinner than you want it to be. Cook the gravy at a simmer for a couple minutes so that it reaches it's full thickness. I like to keep a bit of chicken or turkey stock handy, just in case the gravy needs to be thinned at all. If it is not thickened enough when all of the roux is added, reduce it down a little, by simmering another 5 minutes or so, stirring very frequently.